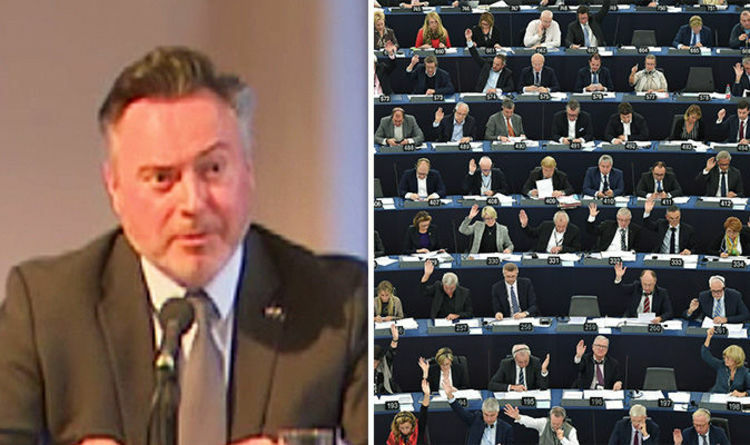 The Scottish politician has admitted British MEPs are plotting to “turn Brexit round” in Brussels thanks to the help of an anti-Brexit consultant. The SNP MEP said he has hired former UK negotiator to the EU Steve Bullock to produce research warning about the “awful” effects of Brexit. Speaking at a European Parliament-sponsored event in Edinburgh on Friday, Mr Smith said: “We need to be really careful about this. What I’m doing is working cross-party with other colleagues, I’ve taken on a consultant – Steve Bullock, who’s a very prominent anti-Brexit campaigner. Mr Smith suggested the MEPs had adopted a “sensitive” approach to their bid to revert Brexit to avoid fuelling discontent among Brexit voters. He continued: “We’ve got to be really sensitive to this. We do need to turn this round because the consequences of delivering Brexit will be awful. The consequences of not delivering Brexit are still significant. Following the 2016 EU referendum, Mr Smith begged Brussels to change the rules for Scotland’s admission even though 38 per cent of the Scottish public voted Leave in the referendum. Mr Smith said: “The people of Scotland, along with the people of Northern Ireland and London, voted to remain within our family of nations. The SNP has been openly opposed to plans to leave the European Union and the party has since threatened to vote down Theresa May’s final deal unless she agrees to negotiate a bespoke trade deal for Scotland. First Minister Nicola Sturgeon claimed in June she would seek a special arrangement for the Scottish economy mimicking the future agreement the British Government is expected to secure for Northern Ireland. Mrs May has however refused to seek an alternative trading arrangement between Scotland and the European Union to implement after Brexit.